Honestly I was not as experimental as I am right now on beauty products. Most probably due to the fact that I had problematic hormonal related acne just until 1 year ago. And believe me! I know how frustrating it can be and not to mention the acne scars, literally scared me. During my acne years (yes 3 years), I was more aware of some beauty products, its terms and ranges. So, it was not all that bad. There are obviously some more products and beauty regime that contribute to my current skin condition. But these are some cleansing mask products I am currently using. Tell me yours as well! 1. Lush Mask of Magnaminty. I have love and hate relationship with Lush products, they have some great products with great natural ingredients. But some are just names, they don't do much, meh. I always use this one when I have some small spots or I feel like my pimple will come out. Do decent job to clean and calm down the skin. 2. 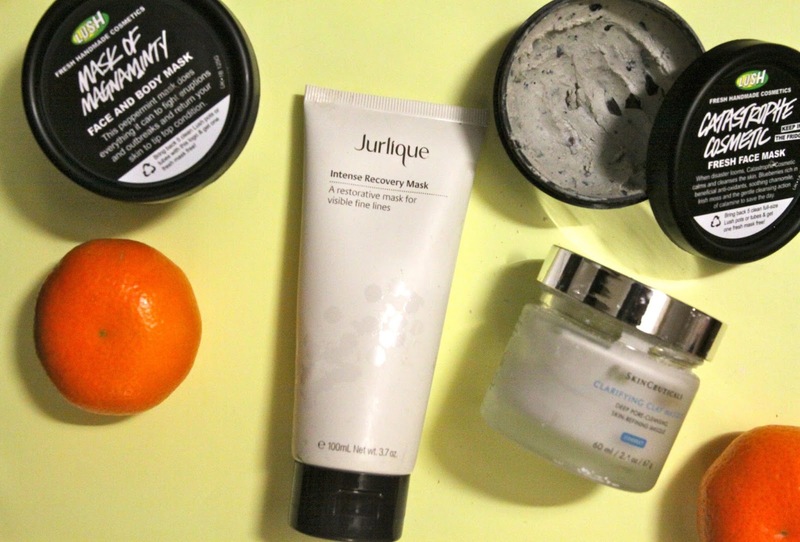 Jurlique Intense Recovery Mask. I tried this one along with its famous sibling, Rosewater spray. So I sprayed the rosewater and spread the mask directly after. Good for hydration and protecting the skin from harsh environment. 3. SkinCeuticals Clarifying Clay Masque. Amazing product for deep pore cleansing and lift impurities. It has a 5% mixed hydroxy acids to help exfoliate as well! 4. Lush Catastrophe Cosmetic. This is from the fresh face mask range, like REALLY REALLY fresh it will expire within 2-3 weeks. This one contains blueberries and some other natural ingredients claimed to provide extra antioxidants. Not really amazing but not bad as well. Something I put on while catching up on my TV series.